This it the final reveal for the One Room Challenge hosted by Calling It Home. This is a semi-annual event where 20 bloggers, made up of Professional Designers, Diy’ers, and Interior Design Bloggers, transform a room from start to finish. We started here with my home office that is primarily used by my children but occasionally by me when I need a quiet place to work. WEEK 1, WEEK 2, WEEK 3, WEEK 4 and WEEK 5 with peeks at our progress in between. and finally have progressed to the FINAL REVEAL. I hope you love it. Because we do! Check out all the final reveals from my talented ORC friends. A huge thank you to Linda at Calling it Home for Letting me be part of this AMAZING CHALLENGE! I hope I did you proud! I’m speechless! It looks absolutely fantastic. Love your choices and how you put it all together. Nice work! Such a happy, fun, and chic space. I love the wallpaper, the elephants, the juju hat, the gallery wall, and the furry chairs. Wonderful job. Love the color scheme in here and the window fabric with the paper. 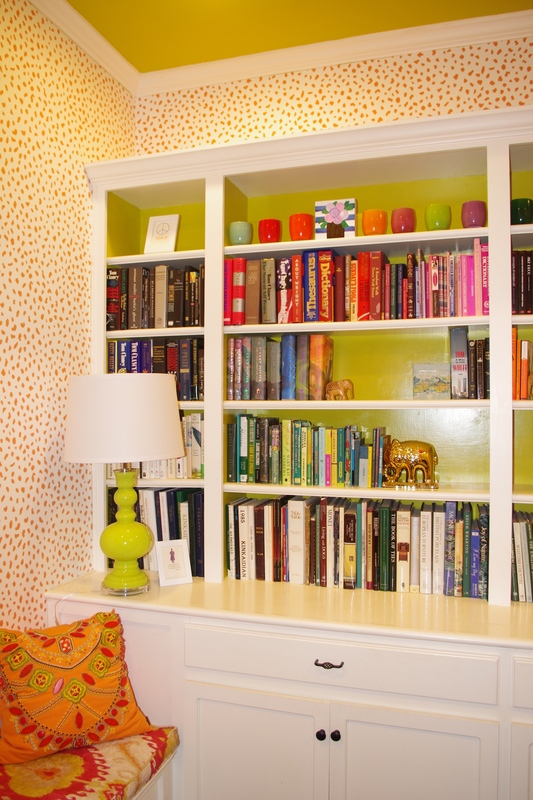 The painted backs of the bookcase are perfect and the pops of orange, fantastic! What a fun space and a great place to go to get inspired and happy! What a fun and vibrant space! Love the furry chairs! Holly, you did an amazing job. I am a huge procrastinator too, so no judgement from me. I would not even know how to measure a space properly. If you ever want to give a tutorial on that, I would love to learn from a professional. This office/music room is so fun. I love so many things, but the portrait of the dog is my new must have. Great job. What a great room. I am obsessed with the wallpaper. How fun! This is my kind of space; colourful and fun! You did an amazing job Holly! Really love that gallery wall and the wallpaper! Stunning! oh bravo – isnt this super fun?! i love that roman fabric…. omg! and the juju hat makes it too! Holly, I love your stylish yet playful combination, and the vibrant color scheme! The wallpaper is a favorite and makes such a statement! Wonderful job! Oh YES!!!!!! Fabulous space dear, truly a designers work space! I love all the color and patterns and the way you styled the room in general!!!!! I’m sure you’ll be spending more hours in this space than ever before! Excellent job! CHEERS!!! Wowza! I love the art wall but the whole space is spectacular. this space is fabulous! right up my alley with the colors and patterns. I just can’t get enough of the wallpaper! and LOVE the fabric on the windows. just perfect. love that art wall…so much eye candy everywhere! great job!!!!!!! I can’t decide what part I like best – the whole room looks SO good!! Well done! I love your mix of colors and pattern and that amazing orange pendant is perfection. Cheers! Wow, where do I start? I adore the spotted walls and all of the layers of color and pattern. Yet it still feels cohesive and fresh. Great job!! So happy, vibrant and chic. Love it! What a great transformation! Love the layering of fun, happy colors! The wallpaper, gallery wall, juju hat the bookcases are my faves! Holy moly, that wallpaper is cute! Great job on all the details. Yay!! Your room came out just awesome Holly! Love the shelves sooooo much!! I have always love that color green. Congratulations it really looks so cool! Love! Love! I’m dying over the shade fabric!!! Bravo! I can decide what is my favorite but I am pretty drawn to the wallpaper and the gallery wall. Everything looks so good against that wallpaper. I love how whimsical the space is….it would be a fun place to work:) Great job and that last picture is so cute….. So cheery! I need to know where the vertical book shelves that are each side of the desks are from. What an amazing transformation!!! I love the mix of colors, patterns, and elements! Pure perfection!! And that wallpaper is so much fun! Everything looks divine!! This is the type of room that takes true talent to execute. Wow. Love how you brought it all together. Dying over that wallpaper and those shades! That wallpaper is the best! So is your adorable dog. What a cool room! It’s so bright and colorful but still full of adult lines and details. Love it! that is one cheerful office. good job! I love it! You had me at first sight on Instagram with your choice of wallpaper and you drew me in with all colourful play with fabrics and print. If I were ever in a bad mood, I’d want to sit in your room!! Bravo, a room to be proud of. Wow – what a fun space and a beautiful transformation! What an amazing space and fun place to work! I love it! I love seeing the wallpaper in this fun color vs. the black on off white we see everywhere. The paper and gallery wall are the showstoppers. Great job! What a fun room! So colorful. I love all the details, especially the wallpaper. I’m in LOVE with your paper, and that ceiling!! You have blown me away. I think I may need to replicate this room in my own home. You did a beautiful job!! Fantastic job, Holly! I love color on the backs of the book cases and the ceiling. Of course, I’ve been dying from the beginning over the paper! Your gallery wall is incredible. I want to work in here! What a fun, fresh room! Well done, Holly! I LOVE it! Holly, it looks amazing. Way to go! That is one crazy room! I. Love. It. I love (covet) your elephants and also love that you use your book shelves for… BOOKS. The room looks great. What a fantastic room! You did an amazing job! Love all the color and how you styled the shelves. FUN! What a happy room! The fabric on that x bench is perfection! What a colorful and happy room!!! I’m not sure I’d be able to get any work done in this space because I would be too busy admiring all of the amazingness!! Well done!